Can you believe it’s that time of year again? The live final of Object of the Year is upon us again, and the finalists are going to the public vote. The two finalists have worked hard and I don’t think anyone would deny that they both deserve their place in the final. 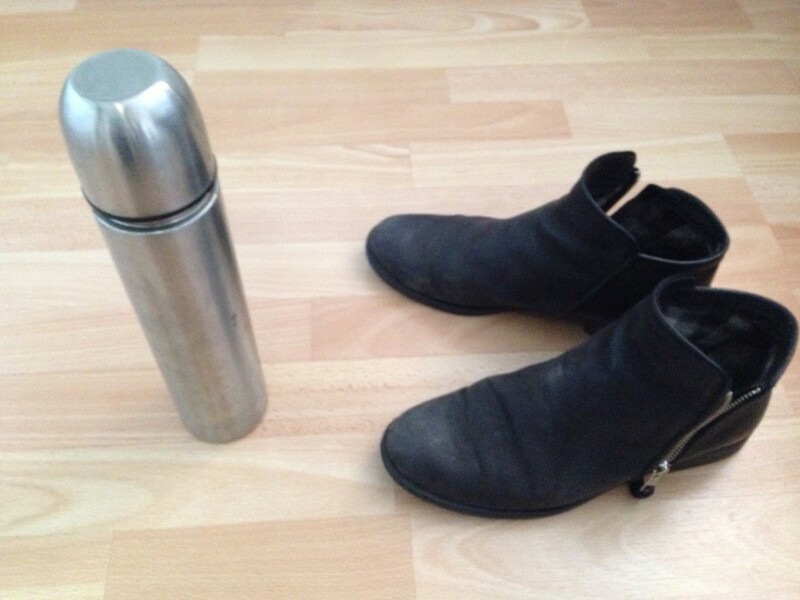 On the left: the flask. Shiny, smooth, tall and well-insulated, it’s not just highly entertaining, it also seems to embody something indefinable about England. On the right: the boots. Their tactile suede surface and shiny zips make them the showy one of the pair. They’re always seen together and their tapdancing duets are truly remarkable. So – it’s that time – cast your vote now! Call 0898 000 000 000 1 to vote for the flask. Call 0898 000 000 000 2 to vote for the boots. Calls may be recorded and monitored for training purposes. Each call will cost one third of your weekly gross income. Ask for permission from your local council before calling. All British Citizens must vote. What happened to the bijou? I thought that was also in the running. Bijou is an adjective so it’s hard to see how it could enter an “object of the year” competition. You mean you don’t have a bijou? I’ve got several, in my car and at work. I use them every day. Don’t you? I don’t have a bijou what? I’ve got things in my car and at work too, but they’re all referred to by nouns. You should have said, mate. We would have gotten you one for your birthday if we’d known. Let me see if I’ve got a spare you can have. … so do you want my spare bijou then or not? I don’t know. What is it? Nobody’s ever given me an adjective before. Okay. I can see that you’re a little confused so I’m going to sort out a little care package. Look forward to bijou!